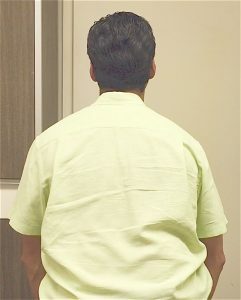 When the shoulders round forward and the upper back is hunched forward, the upper back weakens. The Reverse Fly Exercise helps strengthen the upper back and shoulders by pulling your shoulder blades toward the spine. Here are the steps to properly perform this exercise. Start with a water bottle in each hand to start. Sit in with good posture. Then bend forward at the hips keeping your spine straight. 2. 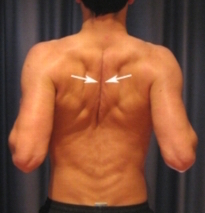 The starting position is having the arms relaxed on both sides. Then raise your arms with a slight bend in the elbow to shoulder height. Hold for 2 seconds, then return to starting position. 3. Repeat for 10 times total for the first time. See how your upper back feels the next day. Pain? Hold off and see your chiropractor. Sore? Continue with only 10 times daily. Tight or no soreness? Add another 10 repetitions. 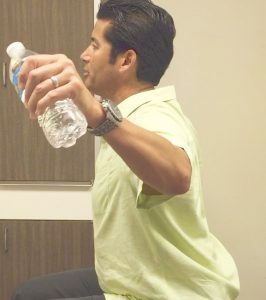 Continues this and start with related exercises below to begin improving your posture. Routine exercises over a period of 4-6 weeks helps you change your habits. Then the longer term effect will be improving your health to tolerate the stresses of your daily life.